A double delight! A Musical Extravaganza! This two-part evening features Stan State's Chamber Orchestra and Opera Workshop performing together! Part One of the evening features the Stanislaus State Chamber Orchestra performing Schubert’s Unfinished Symphony and Ravel’s Mother Goose Suite. 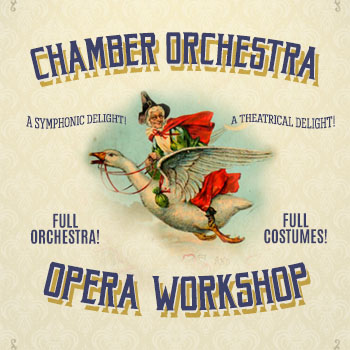 Part Two of the evening features the Stanislaus State Opera Workshop performing scenes from Gilbert & Sullivan Operettas accompanied by the Chamber Orchestra. Full period costumes! A unique event guaranteed to delight! View building 6a on campus map. Complementary parking available in lot 3 beginning 1 hour prior to the event.